While we may be more than halfway through the month of July, there will be plenty of new reviews coming this month to SuperPhillip Central. The first is a game that launched with the PlayStation 4 in 2014. Hence, why this is a Better Late Than Never review! It's Killzone: Shadow Fall! Sony hasn't let go of the idea of making the Killzone franchise its Halo for the PlayStation brand. While the games don't nearly have the same level of fandom as Microsoft's illustrious FPS franchise, the games sell well enough to have Sony keep trying. While I haven't really found a lot of the past Killzone games to be much to make note of, I did very much enjoy Killzone: Mercenary on the PlayStation Vita enough to call it one of my favorite FPS games I've ever played. Thus, after my high on Killzone: Mercenary, I was open to playing the latest game in the series, the PlayStation 4 launch title, Killzone: Shadow Fall. With an engaging single player, a robust online and offline multiplayer offering, and a story that treks into new territory for the series, I ended up enjoying what I played of Guerrilla Games's latest. In Killzone: Shadow Fall, you take on the role of Lucas Kellan. The first chapter of the game delves into the current situation with the Vektans and the Helghast. As a child, Lucas and his father are forced out of their home, and the two stealthily move through Helghast-occupied territory to escape to somewhere much safer. In the process they meet up with an ISA soldier who assists them along the way. However, in a skirmish, Lucas's father is shot and killed right in front of the young boy's eyes. Thus, the ISA soldier takes Lucas under his wing, all the way to the present where Lucas is now a Shadow Marshall for the ISA, and the soldier is now a commander for the ISA, giving Lucas new missions. The Vektans and Helghast now occupy the same planet and are in an uneasy cold war of sorts where any volatile jolt could result in full blown war. A gigantic wall splits up the Vektans from the Helghast, and without spoiling too much, instead of the Helghans being labeled as this wholly evil force this time around, the lines between good and bad blur considerably in Shadow Fall. All of the plot in Killzone: Shadow Fall plays out through protagonist Lucas Kellan's eyes. All of the narrative is told through Lucas's eyes. However, this means that there are points in the game where gameplay is interrupted by long sessions of exposition where your character just stands around or automatically moves. The lengthiest example of this is midway in the game, a story sequence that begins a chapter that last upwards of five minutes. This cannot be skipped unlike the standard scenes that begin and end each chapter, so this makes it really annoying and bothersome on repeated plays of the same chapter. Killzone: Shadow Fall itself is a traditional shooter where you get a maximum of two guns to hold at once, a handful of grenades, and to keep yourself alive in dangerous situations, some adrenaline packs. The latter not only restores your health quickly instead of needing to hide in a corner hoping your health regenerates before enemies can get an angle on you to shoot you dead, but it also gives a brief period where everything slows down, giving you a great opportunity to pop enemies before they know what hit them. 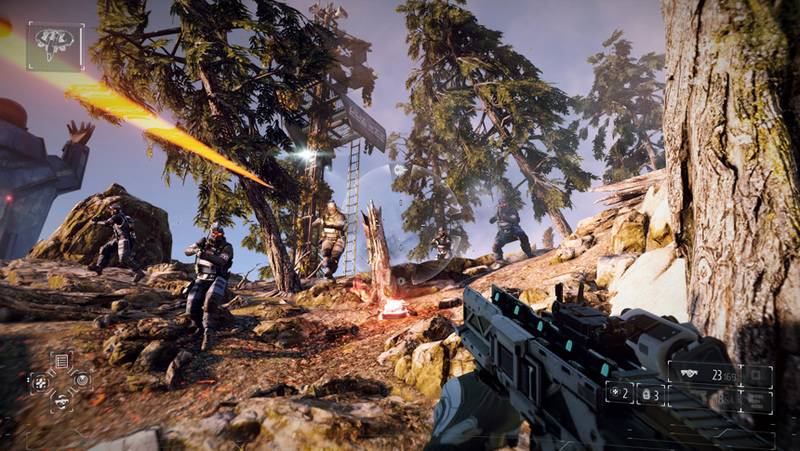 Killzone: Shadow Fall delivers intense firefights and visceral melee action. 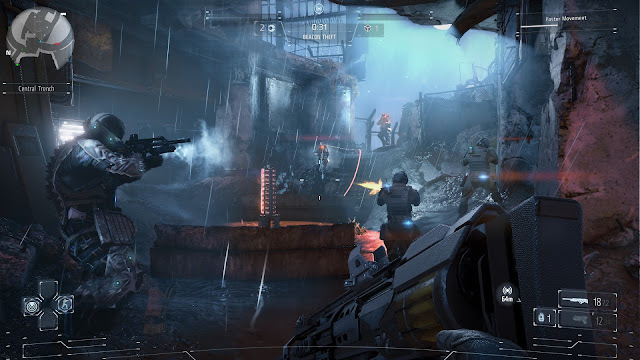 Further moving Shadow Fall away from just being an ordinary shooter is the addition of a robotic companion that assists Lucas on most of his missions, the OWL. OWL has four functions to it, each selected by swiping in a given direction on the PS4 controller's touch pad. Lucas can assign the OWL to shoot a given target, terrific for distracting enemies in an intense firefight; he can have OWL summon a shield that will defend temporary against enemy bullets; he can send OWL out to stun a group of enemies, or with certain shielded enemies, remove their defense; and one of my favorite uses for vertical levels is the ability to have OWL create a zipline for Lucas to zoom across, allowing him to reach otherwise inaccessible areas (or areas that would kill him if he tried to fall down to by himself). OWL's main use is to hack terminals to open doors, shut off security panels, and other electronic systems. It can also be used when Lucas has taken too much damage and give him a shot of adrenaline to bring him back to the world of consciousness or else suffer death. However, of course, Lucas can't just keep using OWL's various abilities over and over with a cool-down period. OWL has to recharge, so players have to use it strategically. This means you probably shouldn't send OWL away from Lucas to shoot down enemies if he's about to lose all of his health. OWL will be too preoccupied to revive Lucas, pending he has a spare adrenaline pack. Many levels offer nonlinear design, letting you as the player take on the level as you desire. Additionally, no longer is Killzone merely mostly a corridor shooter. The level design of Killzone: Shadow Fall is much more open ended for most chapters compared to past Killzone games. While this can result in not knowing where to go, you can always just tap up on the D-pad to get a bearing on where you next objective is. Regardless, the open ended design allows for much more player control in how they handle missions which is fantastic and most welcome. For instance, one can disable security systems so enemies can't call for reinforcements, or they can simply go in guns blazing with reckless abandon. Though, the latter isn't recommended on harder difficulties. One can stealthily move through levels, entering vents and other alternate paths, or they can once again do their best Rambo impression, shooting down foes with their gun barrel blasting as play plow through levels. 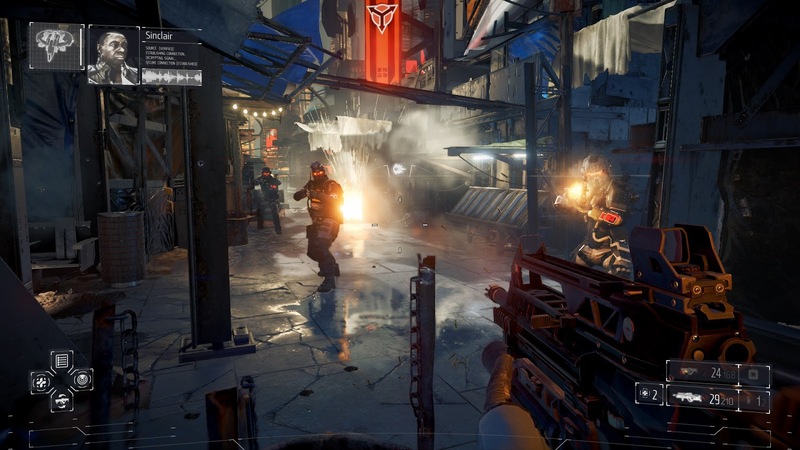 After playing through the approximately 10-hour campaign by your lonesome (that time can greatly increase through going after the various collectibles and playing harder difficulties), you'll probably want to move on to what most longtime Killzone players love most about the series-- its multiplayer. I'm happy to say that despite not being hugest fan of FPS multiplayer games, Killzone: Shadow Fall's offering, both online and off, is pretty darn nice. I see I have two attendees to my shotgun party. Welcome. Did you RSVP? Warzones have parties of people roaming to game after game while remaining together. Of course, you can always play individual matches in a one-and-done fashion as well. There are three character classes to select from and a load of loadout options available. The lack of an experience system means that players beginning the online multiplayer experience won't have fear of feeling far behind because they are not only outmatched skill-wise compared to players who have been enjoying Shadow Fall's multiplayer modes longer, but also because they have much worse equipment. Thus, it's much easier to jump into Killzone: Shadow Fall's multiplayer than a game like Call of Duty, for instance. Not only can you play the Warzones already manufactured by Guerrilla Games themselves, but you can customize and create your own Warzone scenarios yourself. You can select from Shadow Fall's nice selection of ten maps, choose from modes like Search & Destroy and Capture & Hold, and even include bots. Yes! Bots! In a 2014 console game with online! This gave me grand memories of fully customizing every facet of a multiplayer match in Perfect Dark, my favorite FPS game to date, so if Shadow Fall can give me memories of that awesome multiplayer game, then that's high praise coming from me. 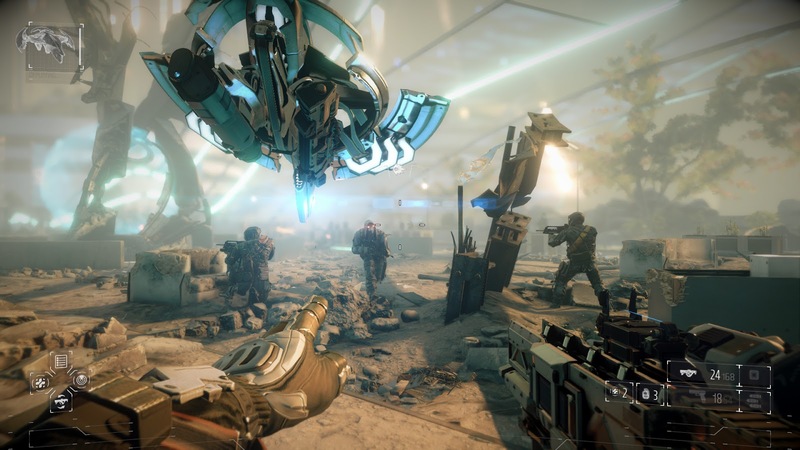 Killzone: Shadow Fall is good for both beginners and longtime players. The visuals of Killzone: Shadow Fall are absolutely jaw-dropping. 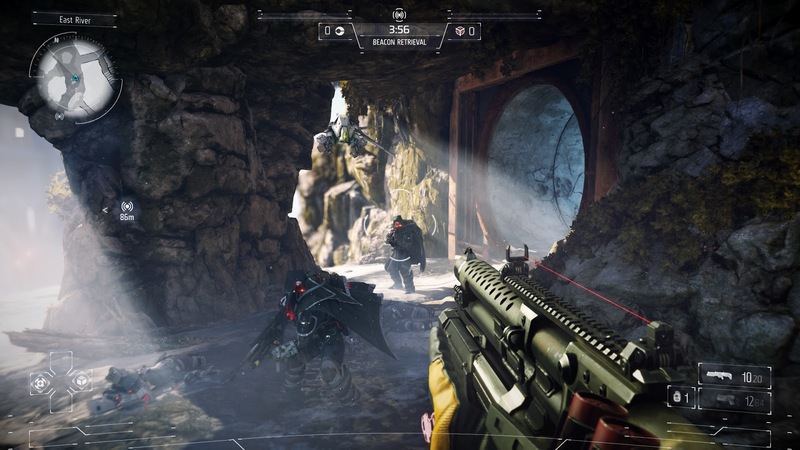 This in part to Shadow Fall moving away from past games' drab brown and grey color pallets to something much more bright, vivid, and vibrant in specific levels. The game manages to hold a steady frame-rate for the most part, even in the most intense firefights. Meanwhile, the sound design manages to delight with consistently well done voice acting and moody orchestrated music accentuating the action and more subdued portions of the game. With a stellar single player campaign and lasting multiplayer goodness, Killzone: Shadow Fall was a pleasant surprise as my first PlayStation 4 game. 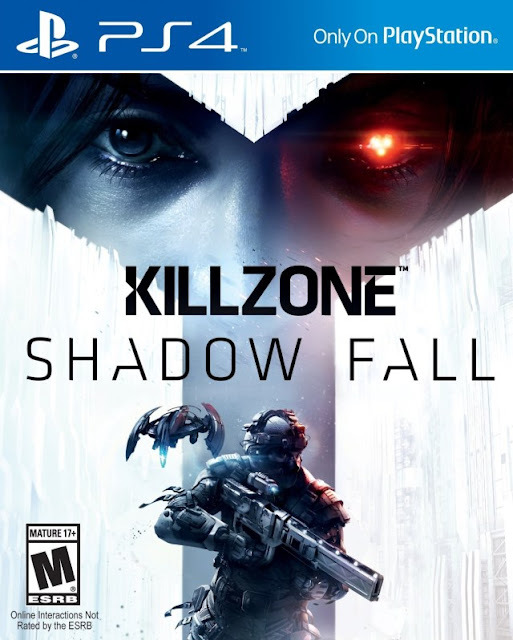 Although the narrative can interrupt gameplay way too much and certain non-shooting segments feel shoehorned in and rather clumsy, overall, Killzone: Shadow Fall manages to be a stellar first-person shooter that is definitely worth looking into for any PlayStation 4 owner who enjoys the shooter genre. Fall in!